Make sure to check the last page (newest posts) in this thread for real time updates on this pack's progress! Quick Links - click them. If you wish to donate, and for some reason the link here isn't working, there is a secondary donation link on the download page which should always work. IMPORTANT: This pack makes extensive use of the connected textures mod (ctm). You MUST use McPatcher to experience this pack as it was meant to be. It will still work without it, but you will miss out on most of the textures. In this release i have entirely overhauled all plant life in the world. This isn't the Broken Anachronism you've come to know anymore. This one is better. I've taken to retexturing individual biomes, rather than individual textures. And of course i've added the 1.7 blocks as well. Check out the screenshots section to see even more! My pack now has addons! 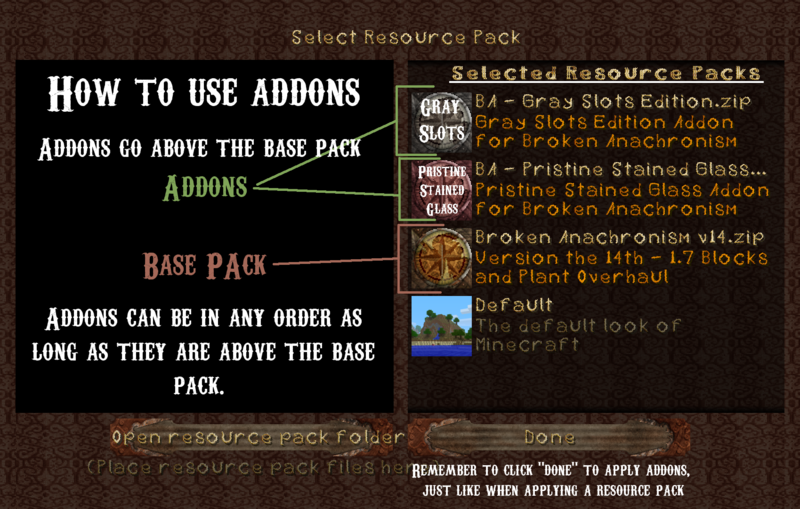 Addons are easy to install and use, and let you customize the pack to your liking. Gray slots edition changes the red velvet background of the inventory and other GUI to gray metal. Some people who are red-green colorblind or have certain types of computer screens were having issues seeing items against the red background, and some simply prefer metal slots. The pristine stained glass addon will make all of the stained glass windows whole again. No more broken bits, just nice, shiny windows. The other ctm still works just fine. The Custom Language Addon adds new names/text for mobs, items, blocks, achievements, and more. It makes everything a bit more lore friendly. Best for use in survival mode. If you donate, you will be immortalized in Broken Anachronism history! If you would prefer to use a different name here than the one i've used for you, just send me a message. Broken Anachronism is licensed to 13thMurder and may not be edited, distributed, hosted, or altered in any way without permission. 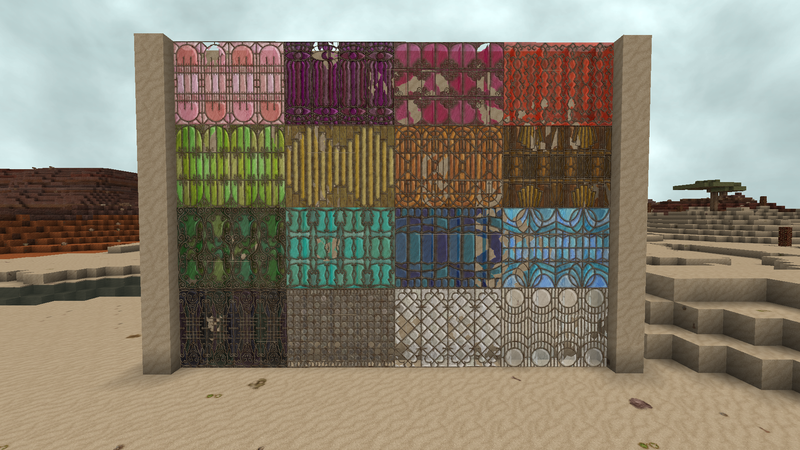 If you wish to host my texture pack on your website, you may only do so by linking directly to this thread (i give general permission for this), or by asking permission to use a direct link. You are free to use my texture pack in videos or screenshots, no need to get permission for this. If you choose to mention my pack in the description of the video somewhere, it would help me greatly, but isn't a requirement. This pack is protected under the gold level TAU emblem, meaning that these textures can only be used after written permission is obtained from the creator of the pack. It also indicates that adfly links on remixes are never acceptable, under any circumstances except by the creator. 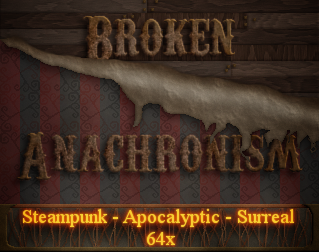 i want this pack to go with an apocalyptic feel as its sort of core theme, wrapped in a steampunk asthetic. thus, all ores will be post consumer items... as in abandoned, garbage, scrap, or just plain lost. in this case, diamonds are in some sort of locked box. the question here is... green handle because it looks nicer (just my own opinion) or diamond handle because its well... a box of diamonds? The diamond ore is weird but interesting. The idea is good but you should make the diamond bigger, and the machinery smaller. Maybe just a part of gearwheel and pipe behind or beside the ore. And the lock is out of place IMO. The ore itself should be more visible anyway. Wow, I think the stone and numbers three and four sands look really amazing I also really like the number one grass texture, however I think from the side-on screenshot it needs a little work, I don't want to criticize much because you are still working on it. Maybe instead of incorporating the steam punk theme into the base elements, because steam punk is something thats created by people use some of the alt textures to incorporate the theme like the alt sandstone's and wood. Over all I really like it and am looking forward to it. criticism is a good thing! im making a texture pack for all to enjoy, so i want to keep all of the elements generally agreeable, and get feedback on what works, and what doesn't. feel free to criticise. but... im not sure what you mean about the steampunk. my texture pack will be apocalyptic as it's core theme, but with a steampunk asthetic. like.... the remains of a steampunk society perhaps. but of course ill be adding a few references to things i like, because i can, like zombie meat being soylent green and such. perhaps a crack in it somewhere showing sparkly things inside? edit: removed due to some mistakes i just noticed. ill put it back soon. But lapis lazuli has not. Finally I think ores should stay ores... with some weird thing around I don't know, but this ? I'm really not sure, but it's just my opinion. The crack that show the ore is a good idea. The ore that could be inside the block, in some kind of mysterious way. I think machinery is ok, but objects like this "tardis", maybe it's too much. I think the screenshots released look nice. I like the way the diamond ore looks. Perhaps the pickaxes (or at least the more advanced pickaxes such as the iron and diamond ones) can be some sort of ore-extracting drills that extract the ore out of the machinery? I'm not all that good about working out how texture packs should look, but I like texture packs that change the feel of minecraft, and I think something like that would. Just suggesting, I'll favorite this texture pack and check out how it's going periodically. yep, i was thinking of making the higher powered tools look redstone powered... depending on what i decide on for redstone wiring's texture. as for the diamond, i could certainly add in an alternate texture. there are a few websites out there that allow the person downloading a texture pack to customize it before downloading, as in for any textures the artist may have done different versions of, its possible to choose which ones to include in the pack. like this site for example: http://minecraftcustomizer.net/browse i plan to use a similar site to that. The sand and top of grass look great, however the cobblestone looks ugly. I'm sorry I can't put it any other way. The stone is okay, but I would give it slightly more definition. The ores are okay. I think that they should look like they're embedded in the stone, instead of just a picture pasted onto the stone. I think everything should just have a bit more dimension and be less smooth. I wouldn't be so critical if I hadn't seen that you wanted criticism. I think this is a wonderful idea and I don't know if you need/want any help, but I wouldn't be opposed to doing a few textures for you... or maybe just possible textures or something...? If you want to I'll post a screenshot of kind of what I'm thinking... i you don't want any help, that's completely fine too and I understand. but as for making the stuff look more embedded in the stone, ill work on that. what i was going for was a stone with a horizontal texture so i could make it sort of tendril-y. look at the lapis or, and how its embeded, thats more what i was thinking, but its not quite right. as for doing some textures for me, no need, id rather do them all myself, but any advice on method is appreciated. as for the cobble, ive since made it far less yellow, and is just a bit warmer than solid gray. i had f.lux on when i textured that... made it hard to judge the color. but if its the shape, cobble is just rather hard to think of anything for. This pack is really amazing, and it looks like it has tons of potential. I have a suggestion though, maybe the diamond ore could have like a glass panel on the box so you could see the diamond inside, I think that would maybe prevent some confusion. It doesn't have to make sense, the world is a fricken taco! im not sure that would really fit in well, but i was thinking maybe something like it being cracked, and a piece of the box is missing showing diamonds inside.